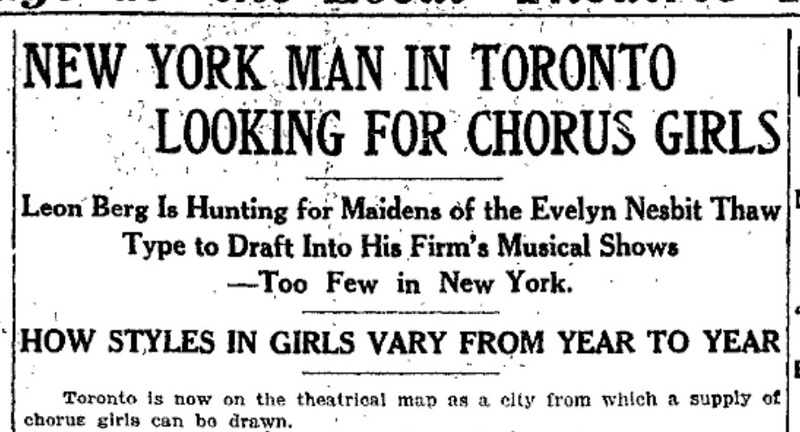 The Toronto World, May 23, 1912. From this brief source it is difficult to know what is really going on here. One’s instinct is to chastise the fun-hating folks of the Toronto-the-Good era, but without more detail this seems unfair. Still, though, it is intriguing to juxtapose this with the modern-day Toronto phenomenon of World Cup victory celebrations, which I wrote about in my most recent Historicist column. Although I focused more on the happier side of the growth of Toronto World Cup celebrations (as opposed to clashes between rival fans), I by no means cherry-picked; the Toronto media seems to have generally heralded the emergence of this regular tradition in the 1970s as a positive affirmation of the city’s diversity, even if several reporters to invoking national stereotypes to do it. On February 8, 1915, Charles “Bert” Massey was shot outside his home on Walmer Road. 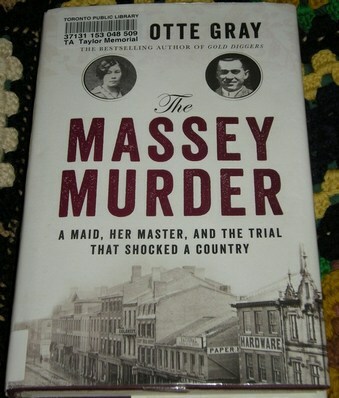 This murder and subsequent trial of his servant, Carrie Davies, form the backdrop of Charlotte Gray’s book, The Massey Murder, which explores several interconnected aspects of Toronto life in the 1910s. To be clear, this is not a whodunnit. Carrie Davies was seen to shoot Massey in front of witnesses, and never denied doing so. If there is indeed a mystery in this book, it is why Davies shot Massey, and what fate the legal system will have for her. In The Massey Murder, though, the trial of Carrie Davies serves as a means of exploring several aspects of Toronto (and indeed Canadian) history, demonstrating how the various institutions of the time, both official and unofficial, could interrelate. My most recent piece for Historicist centres on a 1912 burlesque play at Toronto’s Star Theatre, and the charges of obscenity surrounding it. As with most of my pieces, I was forced to exclude a lot of fun stuff I found in the interest of brevity and focus. If anyone is interested in more detail about the Star Theatre, Rev. R.B. St. Clair, or the Toronto Vigilance Association, I very much recommend Lyndsay Mills Campbell’s essay: “The St. Clair case and the regulation of the obscene in pre-World War One Ontario,” which you can download as a PDF from the University of British Columbia’s Library website here. Last weekend I had the great privilege to attend and (briefly) speak at the Ontario Heritage Conference in Huronia. The Ontario Heritage Conference is jointly presented by Community Heritage Ontario and the Architectural Conservancy of Ontario, and attracts a variety of people from many parts of the province. Given the nature of the organizing groups much of the programming focussed on built heritage, but there were also sessions exploring other aspects of heritage including tours of local museums. The program for conference and description of events can be found as a PDF here. I was part of a panel of younger heritage folk assembled by the seemingly tireless Kayla Jonas for a session called Emerging Issues in Heritage — A Young Professional’s Perspective. This session explored some of the themes that are emerging for the newest generation of heritage professionals and volunteers. Kayla has assembled some of the tweets from the conference (and from the youth panel in particular). I suspect a few of the other participants may also be posting their post-conference thoughts in the coming days. As I found my way to different sessions and talked to a variety of people at the conference, several themes seemed to recur. Here, then, are a few of the major ideas I took from the conference; as per usual, I invite comments below. This probably seems obvious to people from other parts of Ontario, but it’s easily forgotten in Toronto, where culture and tourism seems to be driven by the desire for the next shiny new thing that will finally allow the city to call itself “world-class.” Heritage, in Toronto, is often seen as a barrier to innovation, rather than the driving force behind it, as exemplified by the latest David Mirvish / Frank Gehry proposal which treats the existing heritage buildings on the site as a nuisance, rather than as a resource. In many other communities, however, locals have seen their existing heritage as both a source of community identity and as the basis for their community’s future. I‘m simplifying a bit here; often this case still has to be made and the process is still a difficult one. The thing is, though, I’ve been so obsessed with examples of communities aspiring to obliterate their old buildings in the name of culture and progress that I’ve overlooked times when communities have capitalized on their heritage to restore landmarks or boost tourism. So many of my heritage committee meetings have been bleak and doom-ridden, but this conference was largely uplifting and inspiring, feelings which, sadly, I am not at all used to experiencing when discussing built heritage. At one session, Robert Shipley suggested that heritage advocates make more of an effort to praise governments and developers when heritage is recognized and incorporated into the community and, by gum, I’m going to try to do that. Sometimes, heritage advocacy seems like it is more about knowing legislation and zoning bylaws than it is about recognizing the historic value that heritage properties embody. Several people at the conference raised excellent points about the need to acknowledge and integrate other forms of heritage, including music, dance, food, clothing, language, and pop culture. After all, many of these concepts are what first excite us about history and draw new people to heritage. I’ve grown accustomed to older folks asking me what the secret is to attracting younger people to heritage, as if all young people are the same and can be attracted and cultivated in the same way. Hopefully, this conference served as a reminder that there is no single young heritage professional’s perspective. Kayla’s young professionals panel showcased a variety of persons, both in terms of what people are passionate about and the road people have taken to penetrate the heritage community. Some started as volunteers like me; others have been attracted through studying architecture or planning, through the arts, or through more intangible forms of heritage. While there may be a few trends emerging with the new generation, you cannot paint everybody under thirty with the same brush, or assume that all young people will respond to something in the same way. I knew very few people at the conference and thus spent much of my time introducing myself to random strangers. Not only were people surprisingly approachable, but everybody I talked to had interesting things to say, and common ground was easy to find. Veterans shared experiences similar to mine, and several told me that my tale of how I first got involved in heritage reminded them of their own beginnings. This conference left a full half-hour in between sessions, during which people had plenty of time to grab a snack and have one or two conversations with fellow delegates. In some cases, people used this time to reflect and build upon the ideas raised in the previous session; other times people struck up new conversations. I can’t help but think how much better high school, university, or even the professional world would be if we all got unstructured, unhurried half hour breaks throughout the day. And I think I’d feel a lot better about a lot of my committees if we ended by going to the pub. While I’ve spent quite some time sitting on committees and learning from the members of my local historical society, most of my conversations with other heritage people are framed around specific projects. Very rarely do I find myself talking to other public historians or heritage advocates without a specific purpose in mind. This is something that really should change. When one gets caught up with a specific idea or project, it is so easy to lose track of what larger ideas one wants to convey, or why we do what we do. And when you’re a volunteer with a full-time job, time is precious; there can be pressure to only make contacts who are immediately useful. Several speakers at the conference, including the Friday dinner speaker (and former Toronto mayor) David Crombie, spoke of heritage representing the inter-connectedness of life. It drove home that there’s little predicting just who will be a useful contact to have down the road. Last weekend reminded me that some of the best discussions are ones which come up by accident, or which go in unpredictable directions. I left this conference hungrier to hear even more ideas and opinions, and determined to have more lunches and after-work beers with fellow history/heritage folk. And I’m definitely looking forward to the 2014 conference! In June, I got a full-time job as an archivist at a small archives in downtown Toronto. Sure, it’s great to be financially rewarded for doing the sort of work that I like to do, but this has also limited by ability to do the kind of heritage stuff that I can and want to stick with. I’ve seen numerous other young(ish) volunteers reluctantly step back from heritage commitments after they found full-time employment, and I swore that I wouldn’t be the same way. Certainly, I don’t want to turn my back on the community that has been so good to me over the past few years. After six months, though, I’m realizing just how difficult it is to juggle full-time employment with heritage volunteering. Since last spring, I’ve been contributing to Torontoist’s weekend history column, Historicist. My responsibility is to think up a subject relating to Toronto’s history, research it, and produce a substantial article, once every four weeks. Even before I got a full-time job, I found this a pretty daunting responsibility. Although I was notorious throughout my school years for producing substantial work at the last minute, these articles take quite a lot of time to produce. Part of it is that I am still finding my popular history voice. Another part, though, is that it’s not like I just know all of Toronto’s history and pluck a story out of my head; every four weeks I have to think up a topic that I can reasonably do, frantically find source material, familiarize myself with it, find some relevant images, and construct a story. Whereas in school I was writing essays on topics that were otherwise relevant to the material I was already reading and contemplating for class, I usually don’t know anything about my subjects when I start looking for source material. I remain on thde executive of my local historical society, although I am not nearly as active as I was before. I no longer do original research when members of the public ask questions that the group cannot immediately answer. I’ve stopped submitting content to the newsletter, and have a minimal role in planning upcoming events. I still do one two-hour shift a month at the archives, and attend both the regular meeting and the executive meeting. In theory, my executive portfolio includes handling the group’s correspondence, but I find I don’t have the mental energy or time to provide detailed answers anymore. Most of the time, I just think of who else could answer the question, and forward it along. Often, I go a few days without reading the correspondence, which isn’t good for the organization’s relations. Amongst other things I want to train new volunteers to do the sort of things that I had been doing up until June, but again, I find I don’t have the time or energy. Increasingly, my attitude is just: “I taught myself to do this, so you should be able to teach yourself, too.” This isn’t a good attitude to have anywhere, but it’s an especially bad one to have with a heritage group, where capitalizing on past experience and encouraging the spread of knowledge is supposed to be the whole crux of the organization’s existence. I remain active on the Etobicoke York Community Preservation Panel. I don’t yet feel like dead weight, but this involvement now amounts to little more than answering e-mails and attending and contributing during a monthly meeting. There’s a building in the area which is both worthy of designation and potentially threatened with sale and/or demolition, but even though my knowledge makes me the best equipped person to research it and work with local groups to prepare the designation, I don’t see where I’m going to have the time to make an extra trip to City Archives. Not with my job and each impending Historicist deadline. Shortly before being hired, I joined the executive of the Toronto Historical Association, which is an umbrella group of Toronto-area heritage groups and historical societies. It is currently in a phase of rebirth and new outreach, which means that the responsibility is theoretically somewhat greater than what I was prepared for. I was recruited for this position in part because of my youth and connections with other groups, but find I have very little time for much beyond reading the e-mails and attending the meetings. As it’s an umbrella group everybody involved with it is, by definition, involved with other organizations, which makes it difficult for anybody with a 9 to 5 to give it daily attention. Those who are retired send significantly more e-mails which tend to sit in my inbox until the weekend, at which point I’ll go through them and decide if I’ll be able to send thoughtful responses or if I’ve got too many other things to think about. In addition to the things that the rest of the board would like to delegate to me, I’m constantly seeing opportunities in the THA for other things that I could be doing, but these ideas generally go unshared because it’s not reasonable for me to see the idea through. It is frustrating. I also want to be able to attend other public meetings of interest, or go on walking tours, or see what is happening with other historical societies or museums. But I’ve done none of these things since getting the job. My commitments mean that I rarely get to be an ordinary audience member anymore. And that’s no good because, as I said above, I don’t have an encyclopaedic knowledge of Toronto’s history. I need to go to these things in order to learn and get better at the things I’m doing. This blog has also taken a bit of a hit. I have about ten different posts in various states of completion right now, including book reviews, opinion pieces on various topical heritage issues, and odds and ends I’ve found while working on other projects. Finding the time to carefully choose my words, however, is my biggest challenge, as is motivating myself to use a computer in the evening after spending most of my day staring at spreadsheets on screens. I’m not a complete dreamer/idiot. Obviously, I expected to have less time available once I became employed, and warned all of my groups that my availability was about to become a lot more precious. But the hardest part for me is letting go and seeing necessary work go undone. It seems like everywhere I turn, there are things that aren’t being done that I know that I could do if not for the lack of time. What makes this the most frustrating, though, is that when I don’t do this work, there’s no guarantee that anybody else will. A huge amount of heritage work in Toronto is being done by volunteers. A worrying amount, when you think about it. When I used to tell my friends what I was up to, they naturally assumed that I must be doing very well out of it, financially. The general public tends to think of heritage advocacy and history research and writing as vital, and assume that our society is somehow structured in such a way that those doing the work are being paid for it. And while they sometimes are, so much of what happens in Toronto’s heritage community only happens because some dedicated people are willing to sacrifice their time to see it through. Volunteers are preparing heritage designations, attending public consultations, sitting on committees, creating and leading walking tours, offering public lectures, promoting heritage in schools, performing original research, and providing information to journalists, to name but a few of the roles. And when these people stop, their work isn’t necessarily picked up by somebody else. Right now, it seems like Toronto’s heritage community is really on the hunt for the next generation who will one day take over the reins. Well, we’re out there, but there’s only so much an employed person can do in their spare time. I thought I found a fair compromise in June, but it looks like I need to massively pare down my heritage commitments in 2013. It is, of course, vitally important that we continue to cultivate younger volunteers in heritage, and keep them engaged and poised to inherit our local legacies; it just isn’t reasonable to hand over all of the reins right away. For a historical society executive looking for successors, or for other major volunteer heritage roles which seem like full-time jobs in themselves, we need people who actually have the time to do the job right. I have a lot more to say on this subject, but as I don’t want to end on a pessimistic note, I’m going to save it for another time. In the meantime, I would love to hear from some other heritage volunteers who have had to scale back their involvement following employment. What other barriers have you found to your history/heritage participation? How did you decide what commitments to keep, and what do you tell organizations or other people who want you to do more? The director of the Toronto District School Board, Chris Spence, has resigned after revelations that he plagiarized multiple articles that he “wrote” for the Toronto Star. This gave me reason to consider the subject of plagiarism, and how my thoughts on the issue have developed as I’ve aged. I first became aware of the concept of plagiarism as a student in the Toronto District School Board system, or rather, its forerunner, the Toronto Board of Education. As a high school student, I initially saw plagiarism as a simple issue involving cheating and morality. Plagiarism is a form of cheating, and cheating is wrong; children should learn honesty. Admittedly, I was never really tempted to plagiarise a school essay, probably because I liked writing too much. If anything, I used to have the opposite problem, in that I often found it difficult, as a student, to find room in which to incorporate the minimal number of sources required by my teachers or professors. I was excited by my own ideas, and sources were annoyances which got in the way and clogged up the flow of my writing. In my first two years of university, it would not be uncommon for me to hit the target word count before being able to cite even half the number of required sources. I had to work at learning how to economize with words, which meant learning how to orient my writing around the source material, rather than around my own ideas. But eventually, I did learn this skill, and it’s had a profound impact on the way I write history as an adult. Academic writing tends to put a lot of emphasis on analysis and original ideas, but the goal of popular history is simply to convey information in an engaging fashion. In terms of popular history, I think that if the source material is genuinely interesting, there’s nothing wrong with just filling up the copy with properly sourced statements and attributed quotations. Yes, it can seem aimless or thin, but when the audience doesn’t already know the story, an interesting narrative is plenty. The thing is, it’s completely legitimate to create a piece by cutting and pasting all the best bits from other people’s work, provided that you put these sections in quotations marks and attribute them to their creators. Chris Spence could have re-framed his articles by saying “here is an interesting collection of thoughts on this subject from a variety of other people.” He’d already done the hard work by finding and compiling all these great quotations. All he needed to do was curate these great passages by explaining who had said them, then adding some original words to link them together and provide context. This is, in fact, largely what I do as a popular historian. I don’t have a lot of the city’s history locked away in my head, and I can’t just dash off a piece based on something I already know. Every piece I write starts with a lengthy research phase, which involves looking for books and articles on the subject I’ve chosen. My finished product invariably includes a lot of quotations from the work of others, which I attribute accordingly. A simple example is a piece I wrote for Torontoist on the last night of legal alcohol sale in the Junction before the passing of a temperance by-law. The only primary sources I know of which cover this event are the newspaper accounts. After reading them, I selected and quoted from my favourite passages which formed the basic structure of my piece. The finished article repeatedly notes the source material, allowing for the possibility that the reported facts could have been wrong, or that the journalists of 1904 might have been having some fun at truth’s expense. My job as a historian was to assemble this material, arrange it coherently, and to supplement it with context, such as explaining the issues with prohibition in Ontario at the time, outlining local geography, and drawing on what others had said about the overall history of the area and subject matter. I made a lot of editorial decisions, but most of the best phrases come from the unidentified Toronto journalists of 1904. Writing around the source material is a different kind of writing from the manic, passionate essays I wrote when I first entered university. There’s certainly a place for this other style of writing, which stems from opinion and personal experience. When someone is resorting to plagiarism, though, it’s a good indication that they probably aren’t that into this kind of personal writing, and they probably shouldn’t be forcing themselves to do it. I really believe that Chris Spence would have been fine if he simply collected quotations from relevant articles, attributed them, and published these collages of other people’s insight as what they were. If Spence thought that somebody else had already said something better than he ever could, it would have been fine for him to have said “I really agree with this other person’s comment or opinion.” Spence’s article about the value of school sports has valid points in it that are worth reading, regardless of whether the points originated in the head of Chris Spence or in the heads of several other people. In fact, on most subjects, I’d really like to read a collection of some of the best points made by a variety of people, rather than something that just contains one man’s opinion. Of course, a glaring problem with the Spence debacle is that the head of a school board should be more aware than anyone about the problems with plagiarism, given that the school board itself tends to be harsh on students who plagiarise. It’s not just that the school board preaches against plagiarism, though, or that plagiarism is simply dishonest. A fundamental part of my formal education involved reading things written by other people, and learning how to interpret and write about them. This is, I think, a core aspect of education. The lesson from Chris Spence’s resignation shouldn’t be that it’s wrong to use other people’s ideas, but that it’s wrong to use other people’s ideas without crediting them. Or, more properly, that it’s right to attribute other people’s ideas to their original sources, because reading other people’s work, manipulating it, and incorporating their ideas into our own thoughts, is how we learn. It’s what learning is. Kids go to school to learn how to do this. Plagiarism isn’t just about dishonesty. And it’s not just about being lazy, because it’s really easy to put quotation marks around something and say that it’s actually somebody else’s phrase, experience, or idea. This is what baffles me about plagiarism. It doesn’t seem to save much time or reduce the workload. The only reason I can think of why somebody would repeatedly and colossally plagiarise is that they don’t realize that it’s okay to quote somebody’s work if you just say that it’s somebody else’s work and that you’re quoting it because it’s worth repeating in a new context or worth sharing with a different audience. A serial plagiarist must be oblivious to just how close their cut-and-paste job is to legitimate writing. Chris Spence’s plagiarism suggests that he doesn’t understand that education is about learning how to consider and manipulate the words of other people (with a few simple rules), which makes me wonder just what he thinks education and learning actually are, and also how he was able to become the director of the TDSB in the first place. Spence was the head of an organization whose mandate is to teach children how to think and how to consider the ideas of others, yet he doesn’t seem to have these skills himself. Those with smartphones may be interested in the new (and free) Toronto history app, Toronto in Time. The app combines narratives, images, and physical space to present Toronto’s history across a variety of subjects, themes, and neighbourhoods. I can’t really do an impartial review of Toronto in Time, as I was privileged to be paid for writing a handful of the nodes. Also, I don’t own a smartphone, so while I can readily access the content online I’m not really interacting with the content in the way that the curators have intended. (Although all of the content is accessible on the Toronto in Time website, so anybody with internet access can still full access to the stories.) Still, I do have a few thoughts about it that I’d like to share. First, looking at the map, you’ll probably notice a definite bias towards downtown. It’s worth pointing out that this is only the first phase of the Toronto in Time project; the website notes that they are soliciting suggestions for additional nodes, which hopefully will be rolled out in the future. History, like so many other things, is never really “finished,” and I think it’s important to bear that mind when looking at this app. My understanding is that the initial phase was deliberately limited to a manageable number of stories, and that they tried to choose stories in close geographic proximity to one another, so that users might be able to use the app to improvise self-guided walking tours. Hopefully, some of the future upgrades will fill in the Toronto map, and share more of the history of Etobicoke, Scarborough, and other so-called “outlying” parts of the city. As there are still many great stories absent from the project, why not contact Toronto in Time and suggest some? The notice on the website advises contacting them via Facebook, but they also provide an e-mail address at the bottom of this page, which I presume may be used for this purpose by those of us who don’t use Facebook. What’s important to remember is that not all history writing is designed to be read in the same way. I like to imagine that most of my other history pieces get read on a weekend afternoon by someone who is sitting at home, drinking tea; I am pretty sure that this is not how smartphone apps tend to get used. I think of these Toronto in Time stories as being like virtual plaques. Like a plaque, they cannot hope to convey all of the complexity that Toronto has, nor all the nuances of history. What they can do, though, is present the tip of a history iceberg, and hint at the grand substance underneath. Just like physical plaques, each of these nodes serves to introduce some intriguing aspect of the city’s history, and hopefully inspires the reader to learn more. And I think Toronto in Time does a pretty good job at succinctly reminding us that a physical place, a subject, or an idea is not as permanent or as one-sided as we may assume. One of the strengths of Toronto in Time, I hope, is that it presents history for people who like history, but who either don’t realize it, or who otherwise find it a bit overwhelming. Toronto in Time is, in essence, a fun way that curious people can learn for free, and that’s makes it a pretty great thing. I should also point out that projects like this, especially ones that are free to the general public, don’t just happen on their own. It costs money to set up things like this, and a lot of people put a lot of work into this. Please take some time to note the organizations who funded and co-ordinated Toronto in Time, in particular The Canadian Encyclopedia and Heritage Toronto, and let them know if you like it.